Though it may look like a poor man’s Kirabook, Toshiba promises powerful performance and long battery life with its Haswell-powered Satellite E Series Ultrabooks. Released almost three months ago, Intel’s latest processor, code-named Haswell, is making its way into more and more laptops. Just in time for back-to-school shopping, Toshiba’s adding to the Satellite lineup with its first 4th-gen core-based Ultrabook to the market: the 14-inch Satellite E45t and 15.6-inch E55t/E55Dt. 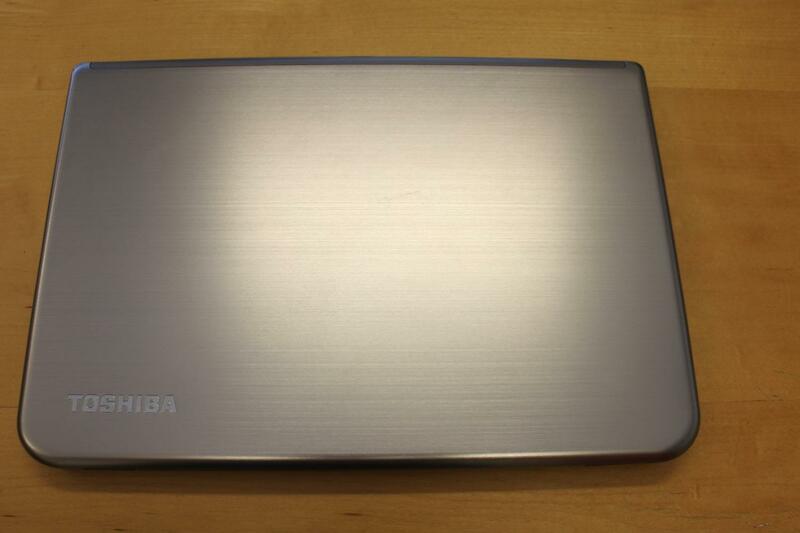 Toshiba’s Kirabook marked a huge turning point for the company in terms of quality and a more luxurious design. Unfortunately, one of our biggest qualms with the Kirabook was its high price (the entry-level model starts at $1,600). With Toshiba’s new Haswell-powered Satellite notebooks, starting at around $800, the company aims to bring more choices into the super-thin Ultrabook category while also making them more affordable for the mainstream buyer. We got some hands-on time with the pre-production models and were able to get a taste of Toshiba’s new Satellite E Series notebooks. Let’s take a look at the company’s latest Ultrabooks to see if they’re a worthy budget alternative to the Kirabook. 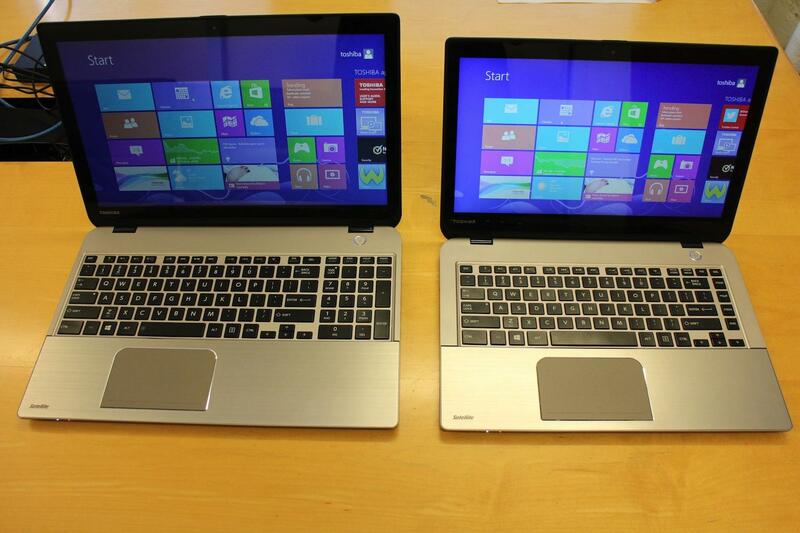 Though we can see some resemblance to the Kirabook in the design, the Satellite E Series is in no way a carbon copy. While the Kirabook uses pressed magnesium alloy around the entire laptop, the E Series uses brushed aluminum on the lid and the palm rest – the rest is plastic. After all, pressed magnesium isn’t cheap, which is why Toshiba went with a less expensive material for the E45t. Still, you’ll find that a good number of laptops in the sub-$800 price range use plastic for the entire chassis, so Toshiba’s inclusion of aluminum in some places is nice touch. 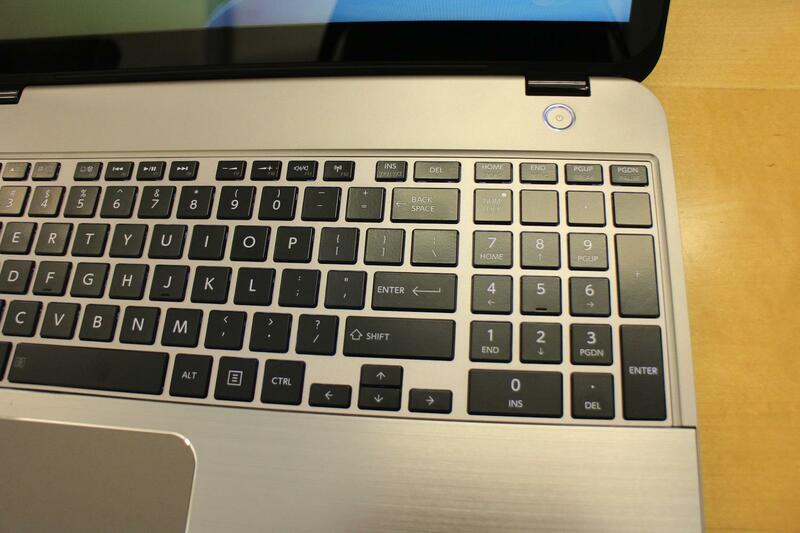 The brushed aluminum also adds a sleek look to the laptop. 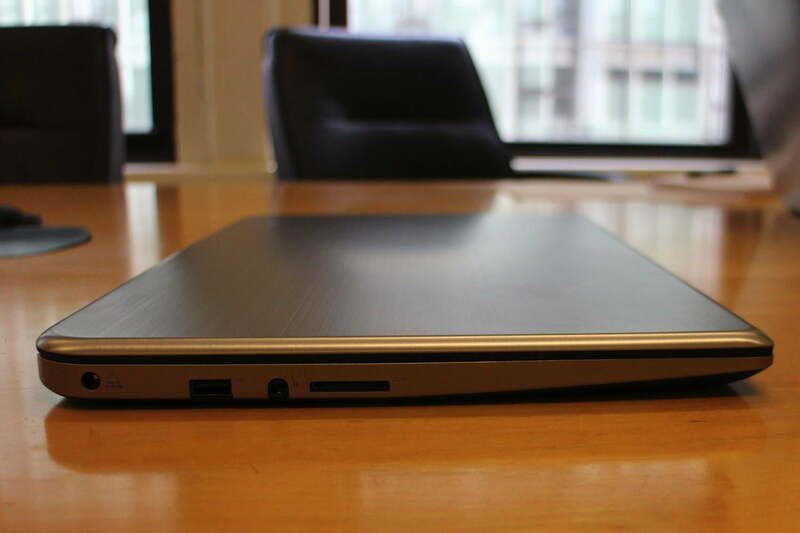 Weighing about 4 pounds (and 5 pounds for the 15-inch model), this isn’t the lightest laptop we’ve seen. Still, at less than an inch thick, the Satellite E45t won’t be too much of a burden to take to class or coffee shop. Speaking of coffee shops, the battery life on the 14-inch model is estimated at 7 hours and 23 minutes (with up to 8 to 9 hours possible with lighter use), which means you’ll easily be able to get a full day’s work on one charge. We have yet to confirm the battery life for ourselves, but, from the Haswell-powered laptops we’ve tested so far, we can confidently say that this is a safe estimate. Along with the 4th-gen Core i5 processor, the E45t starts with a standard 500GB hard drive plus 32GB solid-state drive cache, which is a faster hard drive than you’d typically seen on a typical $800 laptop. It also comes with 6GB of RAM, and the hard drive is configurable up to 750GB. A standard HD touchscreen with 10-finger touch support comes stock in the 14-inch model. The display has a resolution of 1366 x 786, and although it’s not nearly as impressive as the Kirabook’s 2560 x 1440 display, for an $800 laptop, it’s good enough for general use. The E45t was easy to see from various viewing angles, but the display may not be enough for those who do serious photo 0r video editing. Plus, its glossy finish will make it hard to read outdoors, but that’s usually the case with most laptops without matte displays. In addition to the Core i5 processor and touchscreen, another feature that comes standard is voice control. According to Toshiba, Apple’s Siri and Google’s integrated voice search have helped us become more comfortable with talking to our smartphones, and voice control in PCs is the obvious next step. Using Nuance Dragon Assistant, users can control their PC by simply speaking to it. …although it’s not nearly as impressive as the Kirabook’s 2560 x 1440 display, for an $800 laptop, it’s good enough. Want to post on your Facebook wall about how much you hate doing homework? Just say “Hello, Dragon,” and command the app with your voice to update your Facebook status. Want to change a song from across the room? Just wake up Dragon and tell it what to play. We saw Dragon Assistant first hand, and it seemed very responsive and quick. In our demo, we were able to tell it to play Daft Punk’s “Get Lucky” without even having the music app open. Within a second or two, the song started up. Although the Satellite E Series notebooks don’t include the Harmon Kardon speakers that the Kirabook does, they do feature DTS Studio Sound, which came across surprisingly crisp. In a small room without much ambient noise, the speakers will do just fine. However, we’ve yet to find a laptop whose sound quality is good enough to not warrant the assistance of external speakers or headphones – and the Satellite E Series will not be the first to change that. While the 14-inch E45t comes with the latest Intel processor, the 15.6-model gives you the option of choosing a Core i3 or Core i5 Haswell processor, or AMD’s quad-core A6 processor. Toshiba is adamant about making its ultrathin line affordable to the mainstream buyer, which is why it chose to include AMD as a processor option. Though the 14-inch model starts at $800, the 15.6-inch model with an AMD processor starts at $579. 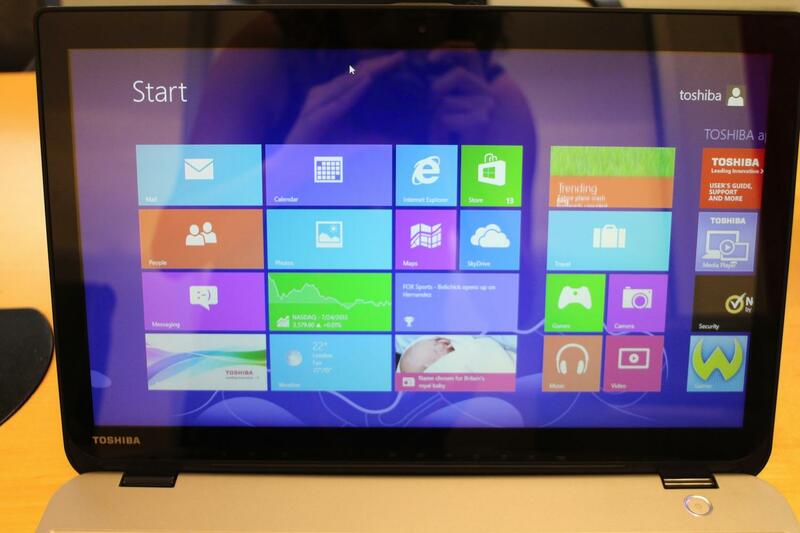 This is the first sub-$600 ultrathin in Toshiba’s lineup. According to Toshiba, the A6’s processor performance is very comparable to what you’d find on a 4th-gen Core processor (we’ll have to test that for ourselves to see if that’s true). The A6 pairs with integrated Radeon graphics, which makes it a good option for multimedia use. However, the $579 model is the most barebones of them all. Though it comes with a 750GB hard drive, it’s lacking a touchscreen as well as voice control software. The E series laptops have two USB 3.0 ports (one of which includes Toshiba’s Sleep and Charge technology), one USB 2.0 port, an Ethernet port, an SD card slot, and a combo mic and headphone jack. While Toshiba isn’t reinventing the wheel with the Satellite E Series laptops, it is taking a step in the right direction by producing an Ultrabook that’s thin, relatively light, and priced at a point that most people looking to buy a laptop can afford. And if they can’t afford an $800 4th-gen Core laptop, Toshiba has a $579 AMD variant available. As we near the start of the school year, we’re beginning to see more of these sub-$800 Haswell-powered laptops pop up. We recently reviewed the $700 Acer Aspire M5-583P-6428, and were very impressed by it. Sure, it has its issues, but for the price, it’s a steal. We have a feeling we’ll feel the same way about the E Series line. Is it worth spending a couple hundred more dollars for a better display and higher quality chassis? Depending on your needs, maybe. But if you’re looking for a laptop that can hold a charge long enough to get you through your on-the-go workday without breaking the bank, the answer may lie in Toshiba’s new Satellite E Series. 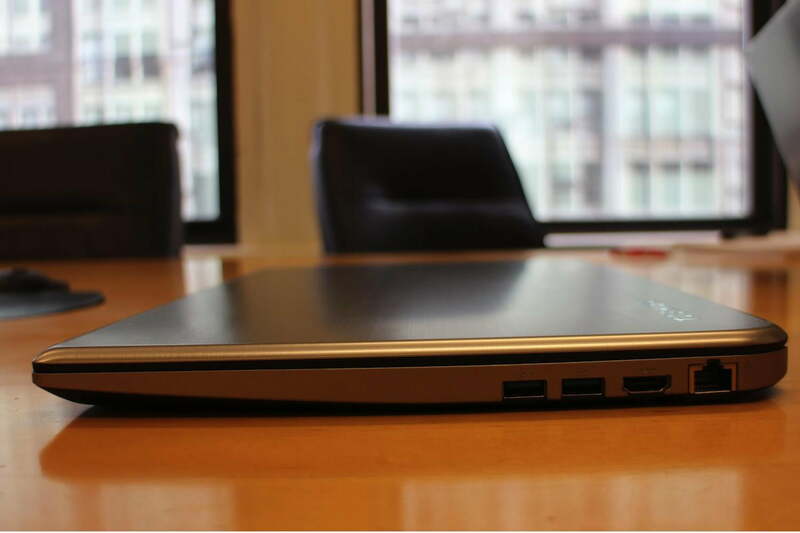 Stay tuned for our full review of Toshiba’s Satellite E series laptops. Note: Prices are subject to change. According to Toshiba, the 14-inch Satellite E45t will be available exclusively through Best Buy and Toshiba Direct starting Sunday, August 4. Toshiba told us it would start at $814 at Best Buy but would likely go down to $800 soon after its release. You’ll have to wait until September for the 15.6-inch models, so stay tuned for more info on those.